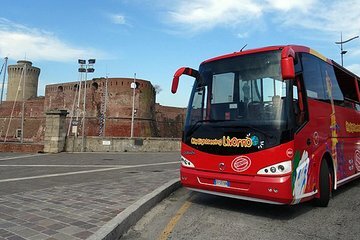 A los viajeros independientes que buscan una experiencia completa les encantará la excursión en autobús Hop-on Hop-off en Livorno. La ruta del autobús comienza convenientemente desde el puerto de cruceros y lo lleva a las principales atracciones de la ciudad, mientras proporciona un comentario de audio. La ruta toma solo 60 minutos, pero puede subirse o bajarse en cualquier momento para explorar la ciudad a su propio ritmo durante un período de 24 horas. Vea los principales lugares de interés de la ciudad en un solo día. Comienza y finaliza el recorrido en la terminal de cruceros. Disfruta de un comentario de audio en el bus al aire libre. We started the tour at 10AM. Right away we were informed that out of the 10 scheduled stops number 6 and 7 two museums were not available, we say ok, The driver drove extremely fast, Never stopped until he got to stop Number 5, Santuario di Montenero there he proceeded to tell us he would be back in one hour. He did pick us up in an hour , drove like a bat out of hell , never stopping again and dropped all of us of at the starting point , many of the people in the bus like us wanted to stop at No. 9 which was the Mercato Centrale.